Visitors come from the countries, United States & India. Topics: Services, Portfolio, Methodology, Seo Services, and Business. 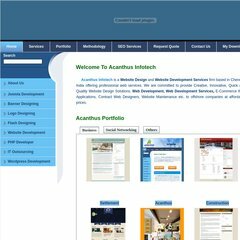 acanthusinfotech.com Portfolio Component for Joomla,Joomla Portfolio Component,Joomla ..
acanthusinfotech.com web design company contact us India,web development company ..
acanthusinfotech.com about Indian web design company, web design company about us India ..
On average 1.80 pages are viewed each, by the estimated 796 daily visitors. It is written for PHP/5.2.17 language. It has 2 DNS records, ns1.lunarbreeze.com, and ns2.lunarbreeze.com. It is hosted by Lunar Pages (California, Anaheim,) using Apache/2 web server. PING (67.210.123.40) 56(84) bytes of data. A time of 50.2 ms, is recorded in a ping test, also its average full page load time is 3255 milliseconds. This is faster than 87% of websites globally.